Edinburgh Monarchs raise the tapes on their 70th anniversary speedway season when they face Glasgow Tigers in the first leg of the Scottish Cup at Ashfield tomorrow night. With continuing doubts over the future of their Armadale base, their home since 1997, Monarchs have not gone overboard with their birthday celebrations just yet and are focusing on their new-look team and the challenges that lie ahead. Team manager Alex Harkess is optimistic that his seven-man squad can once again make the play-offs, which is the passport to title glory. With five crowns to their name during the Armadale era, Harkess would love to make it six. American Max Ruml, Swede Joel Andersson and Englishman Matt Wiliamson are the three new faces in the team and the way they adapt could decide how far Monarchs go in their title bid. Ruml, who last week celebrated his 21st birthday, is looking forward to his UK speedway adventure and, given that he once performed a wheelie with no hands, he has confidence in spades. Ruml knows he will be under the spotlight, but seems relaxed about the attention he will receive. “I have seen the Armadale track and it isn’t too bad,” he said. “It’s a decent sized circuit. As long as I have my bike set-ups right, I should be all right. “I’ve heard the Championship is quite a challenging division but I’m sure I’ll score points. “This is a big step up for me and I’ll be racing in the UK for a full season, but I’m very excited and it’s my aim to try and maintain my starting average. “One step up for me would be to increase it. I just want to go out and have a good time for the first couple of weeks and just try to get round the track. Andersson, who joins Mornarchs from Masarna in his homeland, said: “I had been looking for a UK club for four years and nobody wanted me. So I’m excited to be joining Edinburgh. I’m not the greatest gater in the world – I tend to win my races from the back. Harkess said: “We hope Max and Joel will maintain their starting position in the main body of the team and keep our reserves Matt and Josh Pickering at reserve. It will be disappointed if either of them drop down and push one of the reserves up into the team. Williamson was snapped up from Workington Comets and could be a shrewd signing. 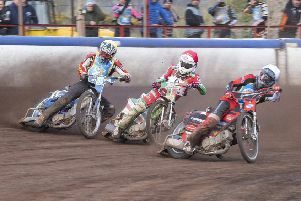 Harkess said: “Matt might initially be better away from home because he will have to master Armadale first, something he didn’t do when a visiting rider with Workington. Of the returning riders, Ricky Wells will start the season at No.1 and might find it something of a struggle to raise his average any higher. Harkess, however, disagrees with that notion, pointing out: “People may say that because he had a dip last season when he fell back a little when he couldn’t get his bike to go. On the question of this season’s goals, Harkess admitted it has not changed from previous years. “Our aim this year is no different to what we always set out to do and that is to make the play-offs,” added Harkess. “We were very disappointed last season to go out to Ipswich Witches in a match we should have won.